In the context of professional services practice and marketing, change is alteration of a process, practice, or condition that varies from the past. First, for all the talk about change, and all the writing and talking and handwringing about change, it becomes clear that too many professionals see change as an event, finite, an end in itself. In fact, change is not an event that’s arbitrarily made to happen, but a process — the result of which is that something changes. Most often, and with rare exceptions, that process leads to an evolution, and sometimes, even revolution (such as professional firm advertising, long forbidden – now common). Second, change is inevitable. It’s going to happen, whether we like it or not. Why? Because the events that contribute to change are too many to control or resist. They come from too many sources, motivated by too many external and unpredictable factors. We can learn to accommodate to the courses of action that portend change, but we cannot control it. In fact, as state bar and accounting associations are discovering, some change can’t even be impeded by fiat or legislation. They keep trying, though. 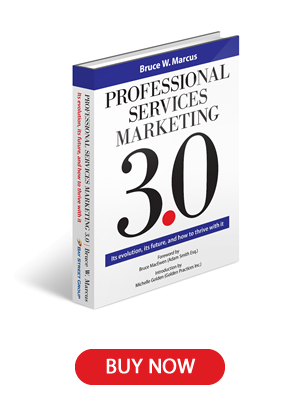 Third, change, in the professions and in marketing professional services, isn’t often deliberately made – it evolves slowly in response to external stimuli. Except for a few visionaries – like Ron Baker of the VeraSage Institute and an early proponent of value billing, Shepherd Law Group’s Jay Shepherd, Exemplar Law Partner’s Christopher Marston, Axiom Legal’s Mark Harris, and Valorem’s Patrick Lamb, who anticipated the future in areas such as billing structures and firm governance – for most professionals change most often comes in response to changing needs of the marketplace, which demand new practices and new structures to serve those needs. Electronic media, for example, wasn’t invented to change the practice of law or accounting – but it served to instigate change in those professions. And not overnight, either. It certainly was a response to the need to compete in an increasingly competitive market. Social media began as just that – social. But it evolved into a competitive tool by virtue of its easy ability to communicate to large numbers of people, as well as to individuals, which makes it a natural instrument of change. It was useful because it circumvented the rigors of external control of the message, which happens in the print media, and has a broader and more immediate reach than does the traditional media. Opportunity, then, precipitates change. Social media, new kid on the block as it was, significantly changed marketing from the seller shouting down to the prospective consumer, to a two-way conversation between the seller and the consumer. The impact of that change is still evolving. Another example of change is value pricing, which has been touted for decades, and is only now emerging as a viable practice. Firm governance, and the traditional top-down firm management that’s long been the tradition in professional firms, is slowly, slowly emerging in new forms that better serve a practice’s ability to help clients. The concept of value now becomes a major issue, which undoubtedly will result in further change, as firms struggle to define it. And if you can’t define it, how do you bill for it? Client service teams are emerging to replace the eat-what-you-kill culture, in which each individual in a firm is his or her own entrepreneur. On the horizon today is the corporately owned or public professional firm. I point this out, not to carp, but to wonder, and to consider, how this process can be dealt with competitively, and whether there is an initiative that can be taken to stay ahead of the curve. There are two main areas in which change is imminent in the professions – firm structures and practices that allow a firm to better serve the needs of its clients, and marketing that’s consistent with the clients’ changing economic environment. Both are necessary for competitive reasons, both are imminent in order to keep a firm relevant to the dynamic changes in the world of both commerce and society.